Japanese Government　(MEXT) Scholarship Students are students who receive scholarships from the Japanese government. There are seven types of Japanese government-sponsored scholarships available under the Japanese Government (MEXT) Scholarship program; for: research students, teacher training students, undergraduate university students, Japanese studies students, technical college students, special training students and the Young Leaders Program (YLP) students. Okayama University accepts international students at the undergraduate level as well as undergraduate students and Japanese studies students. Okayama University accepts international students at the graduate level as well as graduate-level research students and graduate-level teacher training students. The scholarship recipients are recruited and initially screened by the local Japanese embassy (or consulate general, depending on the country). The candidates are recommended through Okayama University nomination to MEXT. ※Only students recommended by a Japanese embassy or consulate general (Embassy Recommendation). In addition to the following conditions, the qualifications are different depending on each category. For more details on this process, please refer to each application guide. ①Research students must be under 35 years of age and be a college graduate (includes prospective graduates) or have completed 16 years of schooling. ②Teacher training students must be under 35 years of age and be a graduate of a college or teacher training college, must have at least five years of active experience as a teacher in a primary, secondary, or teacher training college in their country. (Please note that college and university teachers currently in active service are not considered for this scholarship). ③Undergraduate university students must be at least 17 and under 22 years of age and have completed 12 years of education or have completed courses in a school comparable to a high school level (includes prospective graduates). ④Japanese studies students must be from 18 to 30 years old. 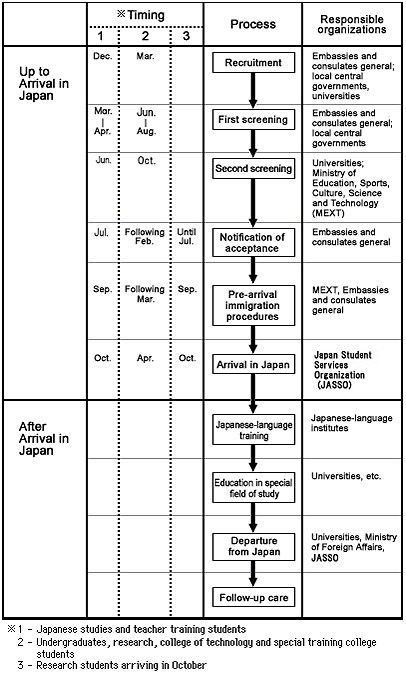 Applicants must be enrolled as undergraduate students in faculties or schools which major in Japanese language or Japanese culture in a university outside Japan at the time when they come to Japan and must be enrolled in the home institution at the time when they return to their home countries. Because the application process differs according to the country in which the Japanese embassy is located, inquires should be made at the Japanese embassy or consulate general in the respective candidate’s country for details. Recruitment is made between March and May for those arriving in Japan in the next fiscal year (April, October). The initial screening (documentary examination, written test, and interview) is made at the embassy between June and August. The embassy then recommends the selected candidates to the Japanese Ministry of Education, Culture, Sports, Science and Technology (MEXT) through the Ministry of Foreign Affairs (MOFA) by the beginning of September. Recruitment is made between December and February for those arriving in Japan in October of the next fiscal year. Screening is conducted between Mid-February and March. Selected candidates are recommended to MEXT through MOFA by the end of April. Research students and Japanese studies students who will be studying in Japan from universities interchange is prosperous on inter-university student exchange agreements can be screened through the national, public or private Japanese university involved as a candidate for a Japanese Government Scholarship. The university directly recommends the selected candidates to the Japanese Ministry of Education, Culture, Sports, Science and Technology. Japanese studies students also basically arrive in Japan in October. ※MEXT does not recruit any students under this selection at the moment. “Domestic Selection” is the application for Japanese government scholarships by privately financed, full-time postgraduate foreign students, prospective postgraduate students recommended by their host institutions. Domestic selection is open to enrolled regular course graduate students, students who will enter regular course graduate studies who intend to continue their studies. Recruitment is conducted through national, public and private universities. Junior colleges are excluded. Scholarships begin in April. Universities must screen for excellent academic achievement and upright personal character before they make a recommendation to MEXT for a Japanese government sponsored scholarship. Candidates who are waiting for the results of any other scholarship applications are excluded from applying for a domestic selection scholarship. Please look for suitable prospective supervising professor(s) from Academic Research Staff. Candidates must collect sufficient information to make an informed decision. Contact potential supervisors directly to ensure the field of study matches the interests of the prospective supervisor. There have been cases of some students who after enrolment found the research of their supervising professor(s) did not match the student’s research goals and they abandoned their studies and returned to their countries. Candidates must exercise due diligence in the selection of supervisors. Only after passing the first screening conducted by the Japanese embassy / consulate general in the respective country may a candidate apply for a “Letter of Acceptance.” Email the following documents to the graduate school you wish to enter by the deadline. Begin the procedures for the acceptance letter as early as possible after passing the first stage. The limit is the end of August. Because screening process differs from normal "Embassy recommendation," inquiries should be made at the Japanese embassy or consulate general in China for applying for a "Letter of Acceptance."